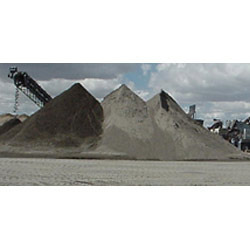 Our product range includes a wide range of washed sand and washed sands. Washed Sand is surface mined, screened and washed to remove silt and clay, then allowed to drain. It is typically a light buff color, almost off-white. Washed sand is a finely graded sand and can be used for fill, to top dress golf course greens, and as a base for laying brick and pavers. Our team of agile craftsmen has created a new definition for beauty and elegance by the virtue of their exquisite workmanship for Washed Sand. This and is processed to provide contemporary as well as classy look to interiors in commercial and residential buildings. The offered sand is precisely processed by our adroit professionals, using excellent quality material and cutting edge technology, in compliance with international standards. Additionally, we provide this tile in unmatched designs and quality. Looking for Washed Sand ?